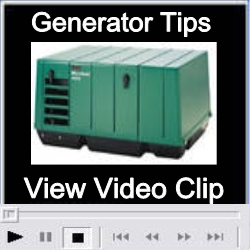 Click on video player for more tips on caring for your RV generator. 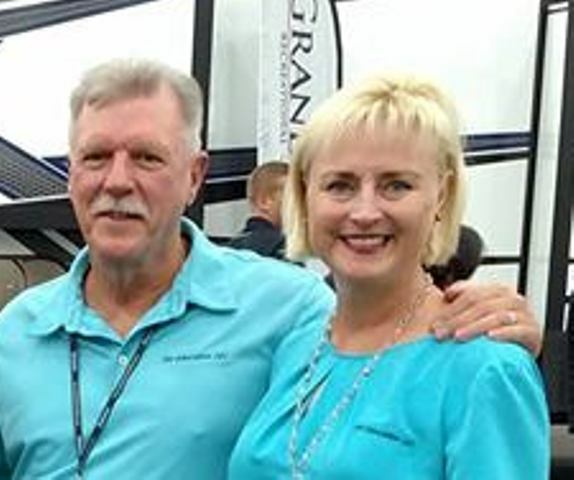 When I worked at a RV dealership, every spring our service department was booked with appointments for generators that either wouldn’t start, or if they did start they had that all too familiar surging sound. This was a result of letting the generator sit for periods of time without starting and exercising it. Lack of use is one of the biggest problems with generators. In gasoline generators the fuel breaks down and gums up causing hard starting and surging problems. This can happen in as short a period of time as two months. Running and exercising a generator is just one aspect of owning and using a generator. Let’s start from the beginning. 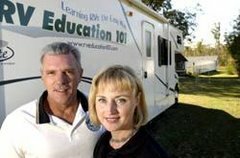 RV generators are what truly make your RV fully self-contained. What a feature, instant electricity at the push of a button. We take electricity for granted in our homes because we don’t have to do anything to get it, with the exception of paying our monthly electric bill. This is part of the problem with RV generators, we expect the electricity to be there when we need or want it just like in our house. The problem is this magical source of electricity requires a certain amount of care and maintenance from the owner. Safety first! Always keep in mind when you use a generator there is carbon monoxide. You should always inspect the exhaust system on the generator set before using it. 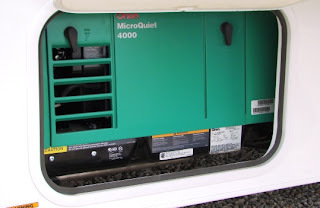 Do not operate a generator with a damaged exhaust system. If you’re using a portable generator set make sure the exhaust is directed away from the camping area. Test your carbon monoxide detector for proper operation prior to using the generator. RV generators are extremely dependable and in many cases will out last the RV if they are properly maintained and cared for. They do not require your constant attention, just some basic maintenance. The first thing you need to understand about maintaining your generator is that they need to be exercised on a regular basis. I mentioned a moment ago that gasoline generators could have fuel related problems in as little as two months when sitting idle. This is one of the biggest problems, but it can easily be prevented if you get in a habit of exercising the generator on a monthly basis. Some people think that this can be avoided by adding a fuel preservative to the fuel tank and then running the generator long enough to get the preservative through the generator set. You definitely should use a fuel preservative whenever the unit will be in storage, but there are many other reasons to start and exercise the generator on a regular basis. Moisture build up can cause damage to your generator. When you exercise your generator it heats up the generator windings and eliminates this moisture build up. This monthly exercise regime also lubricates all of the engine seals and components and helps to prevent carbon build up. So, what exactly do I mean when I say exercise your generator? For a gasoline generator I mean that you start and run the generator with at least a 50 percent load for at least two hours every month. It is extremely important that you run it with this minimum rated load. Generators are designed to run with a load placed on them. It’s always better to exercise the generator for longer time periods than it is for short periods. Check your generator owner’s manual for load ratings specific to your unit. Other maintenance intervals for generators are based on usage. Your generator set will have an hour meter so you can monitor the usage. Consult your owner’s manual for maintenance intervals. The bottom line is, do not hesitate to use your generator and when you do use it put a load on it. A little exercise and preventive maintenance will keep your generator in top operating condition and provide many years of faithful service.